Does this stoop look familiar? Maybe the door colour will give you a hint? How about the tub sofa? Inspired from this photo in the Wall Street Journal... and the colour scheme via Unpretentious Style blog's posting about Eileen Kathryn Boyd... 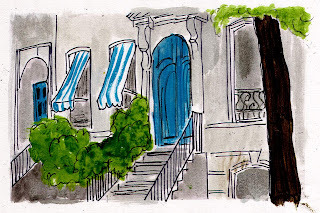 I hope you don't mind staying in NYC another day and viewing a few more famous apartments tomorrow... and maybe a trip to Katz deli for lunch... In the meanwhile... where shall we go to dinner tonight? maybe a Broadway play too? 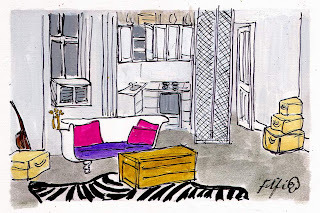 Stay in New York as long as you like - love those drawings and images. 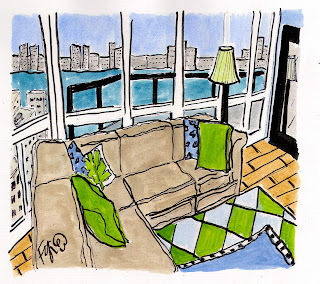 I'd love to live in NYC, and of course, I enjoy with your drawns! Yup I'd hang out with you!! As soon as I saw the bulls head on the wall & the guitar in the one room I knew that it was Holly's apartement. Loving these drawings. Hoping for more. Do you need a roomie for that apartment??? Cuz I can certainly chip in some rent for a view like that. I'll be in New York City next week...can't wait! love these! expecially the first one. Diiner and play? Sounds marvelous! Count me in. I am loving the New York stuff! Ha ha! You did do Holly's apartment! Love love love it! 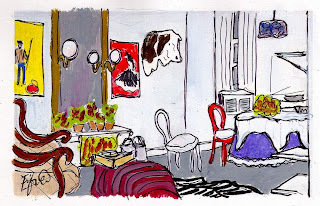 What about the apartment in the Good Bye Girl, after she redecorates it? And how about TV gals, like That Girl?! Thank you for stopping by and leaving such a kind compliment, Fifi. Great artwork! I love New York! Manhattan is one of my favorite places of all time. SO much energy and so many great architectural features to the building. It's alive! These are so much fun. Love the city! I have so missed being able to visit this last week. So much to catch up on! I am loving these NY features. Hope all is well. I am looking for the perfect frame for Alfie's portrait and will post when he is done. These are so lovely! You are very talented. This was a lot of fun! Did you love your stay?